What an interesting concept it would be if a band released an album and then on the supporting tour of said album played all the songs. It makes sense. Why wouldn’t they? The band puts in the hard work, records the songs, so if they’re proud of their accomplishment and the tunes placed on the album then why not play all the songs live on the tour? Oh wait a second, that’s exactly what Weezer is doing. Quite boldly, Weezer doesn’t really abide by all the rock and roll rules. They do things their way which probably explains the loyal following, the fun, sometimes quirky but ever so catchy music and why, just why (and perhaps hopefully) they’ll start a new trend. If more proof is needed of how Weezer plays the game, their sold-out (fire code pushing) show on Wednesday at the very small Roseland Theater in Portland, OR practically doubled as the supporting tour of their sophomore album Pinkerton , which was not widely embraced upon its introduction to the public in 1996, but slowly accepted over time and from which Weezer played five songs. Near the end of the song, guitarist Brian Bell walked on stage to help out and the two then started an acoustic version of “Why Bother.” Bass guitarist Scott Shriner walked on stage towards the end of that song and he opened on vocals for a great rendition of “King.” Drummer Patrick Wilson followed in the same manner and all four members of Weezer were present and accounted for on “El Scorcho” the third of five songs now played from Pinkerton. The house lights still on, Weezer played a nine-song acoustic set in front of a black curtain hiding the larger stage presence to come. The rather appropriate “December” the final tract on 2002’s Maladroit and not played since then, came next, followed by “The Good Life” and then Matt Shultz, the singer for Cage the Elephant performed a duet with Cuomo on “Island in the Sun. The last from Pinkerton “No Other One” and the popular “Buddy Holly” closed the stripped down act. Finally after a 45-minute opening set the lights went dark and, well, the show began. 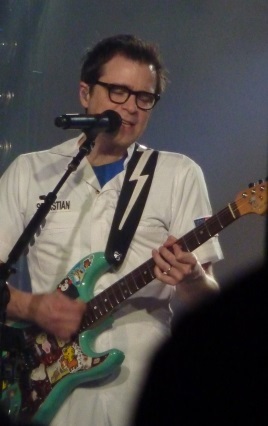 Now wearing different get-ups (except for Wilson), a full arena-style production with lights and four large television screens accompanied the band (and a fifth supporting musician) as Weezer played their new album Everything Will Be Alright In The End in order from tract one through 13. The new album is exceptionally good, ripe with classic Weezer funky time changes, offbeat rhythms and of course those kooky lyrics. There’s not so much of a dud on Weezer’s ninth album, released in October, which comes across just as good if not better live. “Cleopatra” did suffer from a muffled-sound at times but got cleaned up a bit during the chorus and Bell really shined playing guitar and harmonica at the same time. 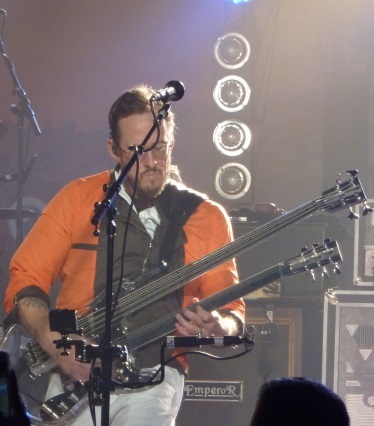 Cuomo nailed the solo. The hard truthed “Eulogy for a Rock Band” (more fun lyrics: Goodbye heroes, you had a good run/Fifteen years of ruling the planet/But now your light’s fading) is a great rock song and should be circling on radio in a few months as well as “I’ve Had It Up to Here” with that awesome guitar hook right out the gate. A quick step off the stage and Weezer returned to encore with “The Greatest Man That Ever Lived” cowboy hats included. After pulling out all the stops, Weezer certainly showcased like one of the greatest bands that ever lived. At least for one night.